Our very popular Candy Cane dress features an adorable candy cane tulle skirt, red satin bow with rhinestone center, velvet body and white collar. This one is a must have for the Holidays. 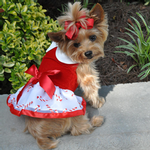 Our holiday dresses also feature a built in d-ring and include a matching leash for easy walking.